Once I had six blocks, I decided for a simple modern layout and sticking with the "Jewel" theme chose a nice Jewel tone shot cotton for the background (which I think is called Prune.) I used three prints to make the backing, the top and middle prints are Anna Maria Horner, and the bottom an Art Gallery Print. Once I had my top and back, and some 100% cotton batting, I was ready to baste. I pin basted this quilt and there she sat for quite a while. I wasn't sure what color thread to use or what quilting pattern I wanted to try. After growing tired of "thinking about it" I went to the store and picked a lovely emerald colored thread that I felt would stand out on the shot cotton background, but blend into the blocks themselves. Then I had to decide on quilting. I can't remember how I came up with this idea, but i knew I wanted to somehow incorporate "sparkles" into the quilting. I wanted those emeralds to twinkle and shine! Be it that I wanted my quilt to have a modern feel, I chose a very organic straight line quilting that stopped and "sparkled" every now and then with no real pattern. The lines are roughly 5/8" to 3/4" apart and the sparkles or stars are just randomly placed. I aimed to have more sparkles on the actual jewels themselves with a few random ones extending just beyond the jewels onto the background fabric. You can see from the photo above and below that I was very organic with these lines, they wiggled all over the place! The quilting process was fun and easy, no big problems and was relatively quick too. I want to say that I quilted this one in roughly two days here and there, starting and stopping a ton. Which is a nice feature of this type of quilting. You can stop after each line if you want too. I'm not going to lie, this quilt wasn't even close to square (or rectangle!) Once I was done quilting, i laid her on the floor and she was seriously wonky. I spent a good amount of time trimming the edges and making her as square as possible, and by the eye, it looks square, so I guess that is what matters most. Who cares that the top edge measures 1/2" longer than the bottom edge! Emerald Cut is bound in Art Gallery Oval Elements in Eggplant. Honestly the binding is my favorite part of this quilt, I just love that I used a print for the binding, but it blends in so well you hardly notice. I love it! Though I have been favoring machine stitching the binding, I finished this one by hand. I felt this quilt was more a piece of art and since it will be a wall hanging, I wanted it bound nice and properly. Finished, Emerald Cut measures 34" x 50." A special thanks to my mom who helped me with the photographs this weekend! She wins the whitest sneakers award for sure! The Emerald Cut quilt was the first project listed on my fourth quarter finish-a-long list. 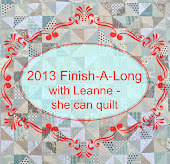 I am happy to say that I met this goal and can link up over at She Can Quilt. Thank you so much Leanne for hosting a great year of the Finish-A-Long! I remember when I first say this quilt I was so taken with it, and that has not changed one iota! I don't remember the 'sparkles' but I love them! Thanks for sharing so many details about your process - I really enjoy that!! Congrats on a very fine finish! I think it's awesome that your "2013 Color of the Year" quilt includes a background color that is very close to the color of the year for 2014.